1 drawing on paper ; 8 x 10.5 in. 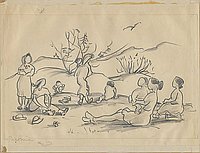 Pencil drawing of five women and four children picnicking. 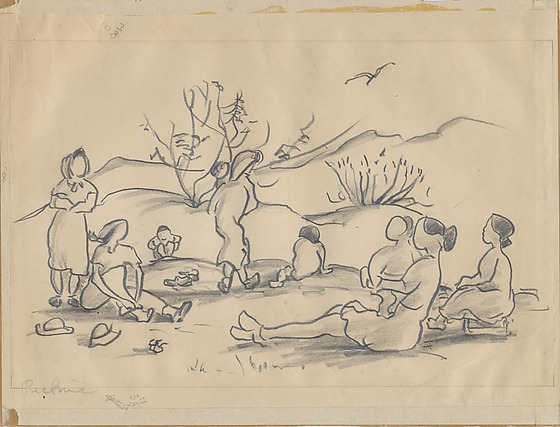 One woman sits on ground in foreground with legs extended and holds a child. Another woman sits beside her on a low seat. A third woman stands on the left with arms folded behind a seated woman putting on her shoes. The fifth woman carries a child as she walks away in the center ; two children play to either side of her on the ground. Shoes and hats lay on the ground. Bird flies above hills and brush in the background. Faint line border. Similar to image 94.195.18.